So today is Pi day, March 14, 1:59:26 am/pm or 3.1415926 . You can celebrate via various methods listed below. Choose one or more and enjoy Pi Day to the 8th decimal place at minimum! Wear a pi t-shirt. This idea can be taken further to include pi jewelry (maybe a necklace whose beads represent the numbers in pi), carrying around a pi mug or clock, or other pi paraphernalia. Bake a Pi, Pie! Here is a tasty Apple Pi Pie recipe in the shape of the Pi symbol! Spread the word of Pi Day! Most people who celebrate pie day participate by gathering in a circle who's circumference is Pi times is diameter! Remember the other form of Pi Day which is Pi Approximation Day which is held on July 22 (or 22/7 in day/month date format), since the fraction22⁄7 is a common approximation of π. 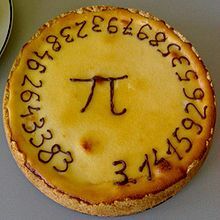 For additional methods on how to celebrate Pi Day head over to wiki how!